The adidas NMD has undoubtedly been one of the most sought after models of Summer 2016 for its comfortable Boost outsole, breathable sock-like finish, and unique colorways. Pharrell Williams has since collaborated with adidas Originals on a number of adidas NMD Human Race releases, each featuring a bold ‘Human Race’ text callout in an effort to promote all of mankind’s connectivity, love, passion, and energy. 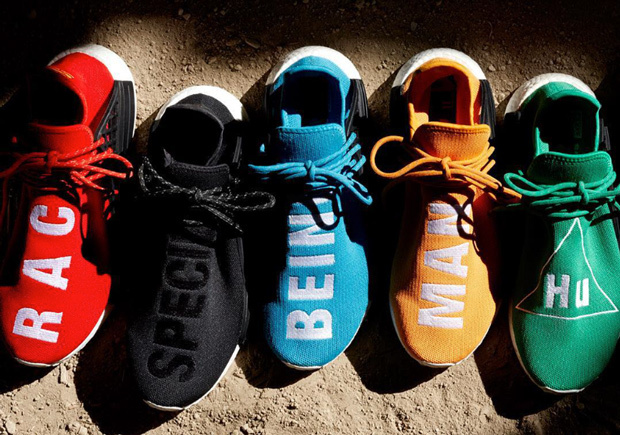 Now we have some good news for those of you who likely missed out on the rather limited adidas NMD “Human Race” – adidas Originals has announced an entire “Hu” NMD Collection with Pharrell featuring 5 new colorways slated to release on September 29th. The adidas NMD returns featuring options in red, black, light blue, yellow, and green – each utilizing brand new graphic uppers and alternative text for a unique twist to one of 2016’s must-have models. Check out a teaser trailer for the ucoming Pharrell x adidas NMD “Human Race” Collection and stay tuned for more release date updates right here on Sneaker News. "The new time that is coming is the time of the human being"